Traditionally an individual is declared a ‘manager’ when having hierarchical control over other individuals. There are many sorts of power that come with it. A traditional manager assigns work, follows up on the execution of the work, is responsible for the results, judges and assesses the people, decides over careers, promotion and salary. A traditional manager is supposed to do so for the better good of the company, but that 'better good' is often unclear to or even obscured from the people assigned with the actual productive work. Is it a surprise that this authoritarian model has serious limitations? In any type of business, except maybe when all work is done by programmable robots. The traditional manager seems brave and courageous, but bottom-line is counterproductive. This traditional way of managing is extremely discouraging, undermines enthusiasm, disregards intrinsic motivation by playing solely on extrinsic motivators, kills job satisfaction, is an open door for politics and bribery. It is catastrophic for any organization depending on people, not programmable robots. It is without doubt disrespectful and inhumane. Scrum, like all things agile, has a very different viewpoint on working with people and on the aspect of management, but it does not disregard that the activity of managing is required. Let’s explore the idea that “Scrum Master is a ‘management’ position”. Contrary to the traditional idea of a ‘manager’, a Scrum Master has no formal power over the people in the Development Team, or their tasks. But a Scrum Master does manage (via) the Scrum process. Within an organization a Scrum Master is accountable for maximizing how people, teams, departments and the organization utilize Scrum. A Scrum Master is accountable for the way Scrum is understood and enacted. This is a true management job, with accountability, sphere and responsibility, but it is an aspect of being a Scrum Master that is frequently overlooked and ignored. The Scrum process provides a frame for the creativity of people and their joint creation of valuable software. The process of Scrum lays out a foundation for rhythm and discovery. A Scrum Master manages the Scrum process through the provision of various services. The services that the Scrum Master provides become a mirror to the state of Scrum in an organization. The benefits gained through Scrum depend on the services provided by the Scrum Master. Or is it the other way around? A Scrum Master teaches techniques for others to use; how to manage Product Backlog (syntax, sizing, splitting, grouping, descriptions, refining, dependencies), how to create visibility of progress (burndown charts, Scrum boards, cards, velocity, release plans, integrated Increments), creating a definition of Done, how to plan and execute a Sprint, how to do a Sprint Retrospective meeting, the value of time-boxing. A Scrum Master helps teams and their wider environment optimize the use of Scrum through Scrum’s foundation in empiricism; how Scrum implements transparency, inspection and adaptation, how Scrum helps where only the past is certain and the future is uncertain and highly unpredictable. 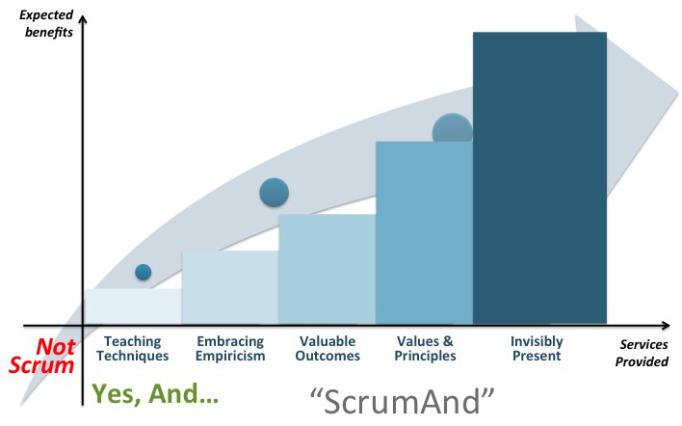 A Scrum Master focuses on the values and principles that drive behavior, instead of ‘process’ and even outcomes. Accountability drives behavior. Behavior becomes grounded in the Scrum values, and Scrum is understood and applied through the values and principles expressed in the Manifesto for Agile Software Development. A Scrum Master is invisibly present with a team, and within the organization; a silent, non-intrusive, mentoring, comforting, observing presence. Scrum Masters are often expected to operate on the practices end, to be teaching techniques. Scrum Masters themselves look for ways to be invisibly present. The happiest moment for a Scrum Master occurs when teams push back for being provided with too low level services. Complexity equals instability and rules out linearity, by default. A Scrum Master keeps going back and forth, up and down through the range of services possible. It is not about linearly, sequentially progressing through the presented services, unidirectional upward. A Scrum Master does not steadily provide only one type of service. One can be a manager with accountability, without employing command and control management techniques. A managing Scrum Master is a wise leader who engages people through purpose, vision and motivation. And through living Scrum.